Paperback, 9 x 11 in. / 110 pgs / illustrated throughout. Edited by Ruba Katrib, Camille Henrot. Text by Ruba Katrib, Sypros Papapetros, Serge Daney. 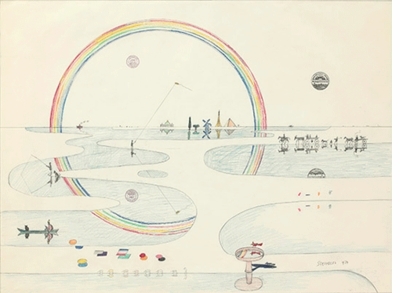 Thinking through early twentieth-century cartoons, the kaleidoscopic drawings of Saul Steinberg, the film Who Framed Roger Rabbit? 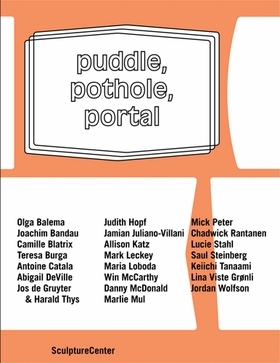 and other children's entertainment, Puddle, Pothole, Portal explores the coexistence of disparate elements within shared spaces. Gags betray complex meanings and sociopolitical satire, and unrelated objects, locales and avatars interact in the same dimension. As screens, passageways and shadows populate both physical and virtual realms, we question whether they are reflections or traces of the objective world, obstructions, fantasies or entryways into other realms. Contributing artists are Olga Balema, Joachim Bandau, Camille Blatrix, Teresa Burga, Antoine Catala, Abigail DeVille, Jos de Gruyter & Harald Thys, Judith Hopf, Jamian Juliano-Villani, Allison Katz, Mark Leckey, Maria Loboda, Win McCarthy, Danny McDonald, Marlie Mul, Mick Peter, Chadwick Rantanen, Lucie Stahl, Saul Steinberg, Keiichi Tanaami, Lina Viste Grønli and Jordan Wolfson. FORMAT: Pbk, 9 x 11 in. / 110 pgs / illustrated throughout.